I think you have a valid point on how we have not been getting our fair share of state/federally funded "free" roads and I've complained about that on here before. And if they do just go and raise 408 tolls by 50 cents, I'd be against that as well. I'm generally against all tax increases, I think there is enough waste already and things can be reorganized to offer better service without charging more. I just think the congestion pricing lanes offer a really unique, better way to solve the problem. It really gives the people a choice, and the price isn't just said to take money from the tax payers, its set to cause the roadway to flow at an optimal speed and carry an optimal number of cars, which means adding 2 lanes to I-4 without the congestion pricing would add much less capacity to the roadway then the same project with it. A 5 lane highway where all lanes are congested carries many less cars then a 2 uncongested lanes and 3 congested lanes. ﻿ Unfortunately, the academic remained in its ivory tower on this and remained complicit. There is certainly a case to be made for congestion pricing, but it needs to be limited to highly congested downtown urban areas, not broad swaths of an MSA. I think the Seminole 417 toll within a toll was a bit more complicated then that... many felt the said portion of highway doesn't have real serious traffic problems in the first place, so we're spending all this money for potential future problems and gonna have higher tolls with it. I also think the Seminole county folks really missed an argument there that could have really made it a win-win situation for everyone... demand, especially given our areas lack of gas tax funded highways thats was previously mentioned, demand that the FDOT/FTE convert the existing lanes to be free as a right for being able to charge whatever they want (congestion pricing without limits) on the paid lanes throughout the portion of the project getting those lanes. It probably would have resulted in an increase in traffic for the free lanes, making the paid lanes more necessary and providing all the aforementioned benefits of the freeway systems. I'm sure if that was the solution proposed, almost everyone would have been on board with it. Orlando really should have fought harder to say the Wekvia Parkway should have been required to have free lanes throughout the project bounds, even if they wanted toll lanes in the middle of it. I definetely will appreciate having express lanes all the way through the metro when beyond the ultimate is completed. There is no reason that only downtown urban areas are the only ones that need improvement in traffic flow, or could benefit from an optional premium price that subsidizes the free lanes. Miami/South Florida is well on their way of adding express lanes to pretty much every highway down there. They got free lanes on most too, but it is working down there. I believe so, isn't it supposed to be 4 levels of interchanges? 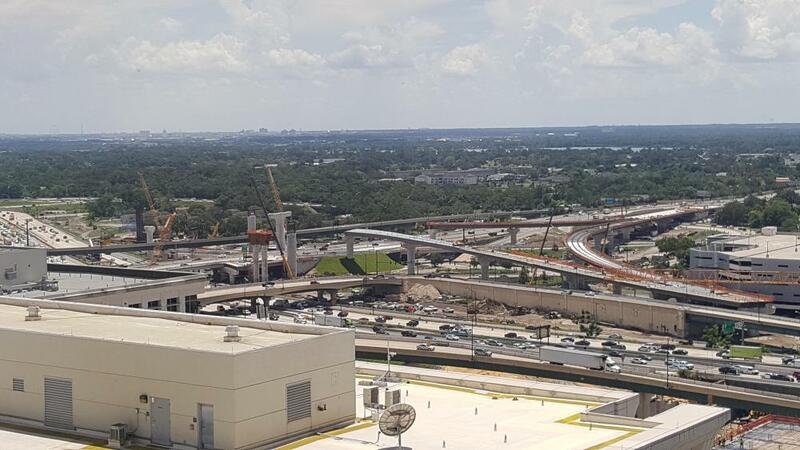 I believe it will end up being more ramps then that one as well (I still never saw the exact plans for the direct 408 to I-4 express flyover ramps), so roadgeeks can rejoice! Will this be I-4 eastbound at the 408 soon? ... a westbound ramp that was begun ten years ago and never completed. "Once the bridge is built, it will be the tallest of six new bridges for the whole interchange, standing more than 200 feet above the ground. 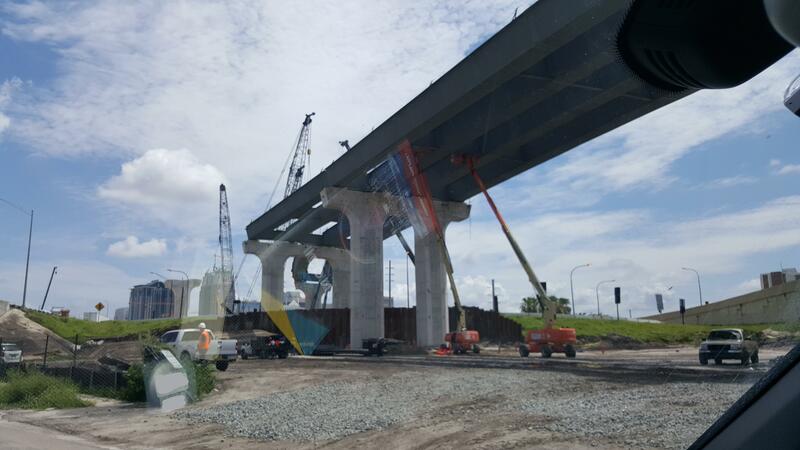 FDOT said the project should be done in three years." The ramp will connect 408 west to I-4 west. Should offer a pretty impressive view of downtown. Those who are driving won't be able to do much looking. Driving by the most recent construction I was surprised by how close the off ramp from I4 west goes to the Amway Center - it's going to feel like you can reach out the passenger window and touch it! I still annoy my wife by threatening to go DUKE BOYS on that stalled ramp. Yea it was on purpose. The Geico garage is curved to follow the proposed ramp sort of like how OUC hugs the other ramp. Is "Under I-4" pretty much a go when the highway is completed ? This is crazy looking. My gosh. Growthspotter reports that FDOT is preparing the take 40 acres adjacent to I-4 on Palm Parkway for an extensive retention pond. What this means is that the "Otown West" development is dead in the water, despite it being under contract. One has to wonder if the power of FDOT over cities and counties is doing more harm than good. This story doesn't really make sense. The owner just spent weeks clearing that land. Shouldn't he have known the land would be part of the Beyond plan? I would expect a court challenge to the taking. According to the owner, they believed FDOT was just taking like 4 acres to have room for a new ramp, and not 40 acres; apparently more room then anticipated is needed for I-4 Ultimate's drainage requirements, which FDOT discovered while working to finalize construction plans for this section, which is supposed to be done at the end of the year. Even with this 40 acres, there is still not enough drainage/retention according to the article. He found out mid-June, after clearing work already commenced. It does sound like he has already hired a lawyer as well to fight the value of the land, he wants to be compensated for the value of everything under contract, not the current value of the empty land. That does sound fair. I'd expect those who have the land under contract and have spent money designing for it to be compensated for that as well. I agree, but that could get messy. This is very common with people who own land that know is going to be taken by eminent domain. There's vacant land and when it's time to buy RW the owner will hire a developer to quickly make announcements, draft plans, file for WMD permitting and even clear land to "prove" they intended on developing the land rather than let it sit vacant to force FDOT pay top dollar. It happens all the time. FDOTs plans have been on the website for quite some time. It's no secret. Is this the land just north of the Darrel Carter overpass? I drove past today and they have tons of storm pipe stacked up. They appear to be doing more than just clearing the land. Getting permits and maybe doing some clearing before FDOT pays is common but this seems to be different.